Starring Chris Pine, Florence Pugh, Aaron Taylor-Johnson, Stephen Dillane. Co-written and directed by David Mackenzie. Opens Friday at TIFF Bell Lightbox. 121 minutes. Historians are almost certainly going to be miffed by Outlaw King, a film that glorifies one of Scotland’s greatest national heroes, Robert the Bruce. That’s because the film ends at the Battle of Loudoun Hill, seven years before Bruce’s crushing victory over the invading English at Bannockburn. Even today, Bannockburn is a revered part of the collective national conscience of the Scots so, unless there’s a sequel planned (which seems unlikely), moviegoers will have to settle for the much less celebrated victory at Loudoun Hill. Still, there’s quite a lot in Outlaw King that works very well. Director David Mackenzie has assembled a very decent cast and has clearly taken great pains to get the period detail right. The cinematography by Barry Ackroyd of the achingly beautiful Scottish countryside is such an added bonus it’s almost too bad there isn’t more of it. Since the film has gotten a major trim of 30 minutes or so from its debut at the Toronto International Film Festival on its way to Netflix on Friday, perhaps it ended up on the cutting room floor. 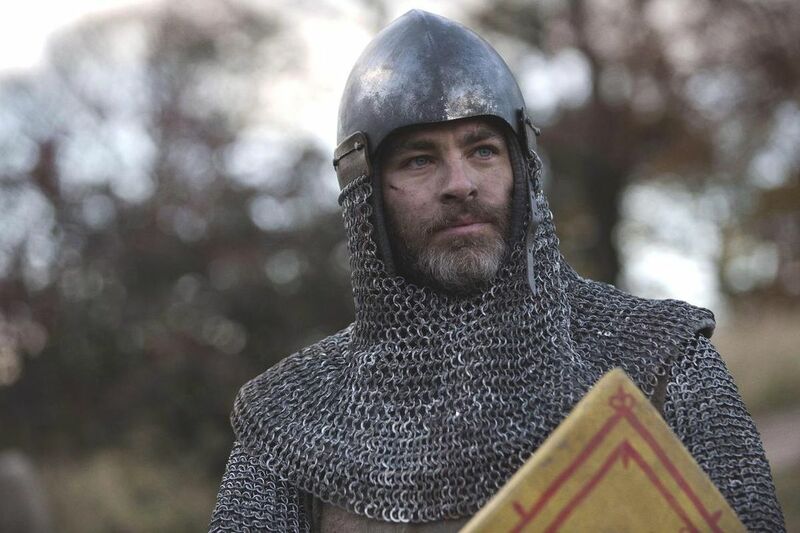 In any case, Chris Pine does a very fine job in the role of Bruce, portraying a canny man of character forced to break an oath to God and abandon chivalry to liberate his fellow Scots. The relationship between Bruce and wife Elizabeth (Florence Pugh), who’s given to him as a prize of sorts for agreeing not to rebel against the English, is well expressed and touching, thanks to two fine performances. There are a host of great supporting performances, including Stephen Dillane as Edward I, who really was the bane of the Scots, and Billy Howle as his son, later to become Edward II, although their relationship (which is critical in the historical context) is less well done. “You just don’t like me very much,” Prince Edward says to his dad early on, something that while no doubt true doesn’t have a particular ring of authenticity. Aaron Taylor-Johnson deserves particular mention for this performance as the ferocious Lord Douglas. There is plenty of gore and bloodletting throughout, and the final battle scene is well executed, although it feels a bit anticlimactic. The postscripts offered just before the credits roll don’t really serve the story or the actual history particularly well. Outlaw King is still quite a decent historical romp even if it falls a little short in achieving epic status.